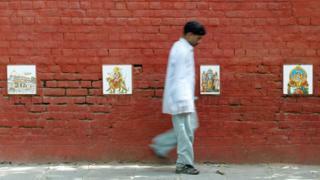 How can India stop people urinating in public? Spend any time in India, and you will see men urinating in public. In the state of Rajasthan last month volunteers began shaming offenders by drumming and blowing whistles. But some argue the country also needs more, and better, public toilets. A few days after we moved to India my son pointed to a group of men standing in front of a wall near our flat. They were all laughing and joking as they urinated in public. He looked at me, confused, and said, "Why are they doing that?" Five years on, I am still trying to find an answer. Travel around the world's largest democracy and you better watch where you are walking as you will find men - and it is almost always men - urinating and spitting everywhere. An Indian friend of mine recently joked that it has become a national pastime. "We will do it anywhere," he said with some pride. Even as Indians, we are forced to recoil with horror at the infinite tolerance of fellow Indians to pile-ups of garbage, overflowing sewage, open drains and generally foul-smelling environs. Governments too naturally reflect the same traits. Go to any government hospital, for instance. Are Indians by nature unhygienic? The decision by the authorities in part of Rajasthan to try and stop people urinating in public by embarrassing them has started a debate here. A columnist in one of the country's most popular English language newspapers recently asked the question, "Are Indians by nature unhygienic?" His answer, which angered a number of his readers, was "Yes". Armed with a copy of his article, I decided to pose the same question to some friends of mine. Bikram, part of India's new young cash-rich middle class, was the first to answer. After glaring at me for a few seconds he said: "How can you even ask such a stupid question?" The answer was quite simple, he added. "There are just not enough toilets here." There were lots of nodding heads around the table. Bikram had a point. India's rural development minister Jairam Ramesh recently said that the country needed toilets more than temples. Almost half of the homes in the world's largest democracy do not have one. His comments led to protests outside his house. But a few days later he urged women not to get married unless there was a toilet in their new homes. There was silence following Bikram's comments. It looked as though our discussion was over. But then Tina, a housewife, decided to have her say. "It is not about toilets, it is about a lack of civic sense," she said, adding that just a few hours earlier she had seen a man urinating on the street, right in front of a public toilet. "It happens all the time, and it is disgusting," she said. I looked at Bikram, hoping for a response, but he had nothing to say and pretended that he had to make an urgent call. But a friend of mine from Mumbai, Raju, shook his head. "Have you ever been to a public toilet?" he asked. "They stink. I had one near my house and they had to knock it down as you could not walk within 50 yards of it without being physically sick." Tina, though, was now in full flow. "Well that is because of caste," she said. "We expect people from lower castes to clean toilets. We will not do it. Until that changes the problem will remain." Her friend Brinka, who was sitting next to her, wanted to say something. Her eyes were fixed on all the men around the table. "Can I ask you guys why we women can wait until we find a toilet but you men can't?" she asked. None of the men around the table dared to answer. As I walked home I saw a man standing on the pavement. Legs apart. You can guess what he was doing. I asked him in Hindi: "Why could you not wait till you got home or find a toilet?" He looked at me like I was mad. "This is India sir... this is what we do," he replied. Listening to our conversation was a policeman. I asked him why he did not stop him. With a smile on his face, he said: "What is the point?" Those words kept ringing in my head as I continued my walk home. How could you solve the problem with that attitude? As I looked up, I saw pictures of the gods on the wall in front of me. They had been placed outside a house so that people would not urinate on it. India may need more toilets than temples - but in this deeply religious country, it seems that divine intervention is the only thing that can stop men from urinating in public. BBC Radio 4: Saturdays at 11:30 GMT and some Thursdays at 11:00 GMT. BBC World Service: Short editions Monday - Friday - see World Service schedule.